We are going camping! I’m not sure how I feel about it, but the boys seem sort of nervous and sort of excited. I’m wondering how we ended up in this spot. I have been camping before, but not real camping—more sleeping in a tent on a school retreat way back a thousand years ago when I was in high school. But our sons are Cub Scouts, and this is part of the deal. 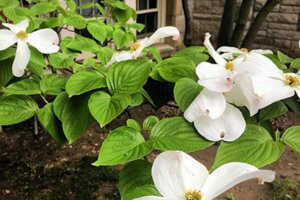 “Will we find our meals in nature?” my younger son asks. I hope not. But I don’t really know. I’m not exactly a camping expert. But I would, of course, do anything for our children. I suspect this trip can only exceed my expectations. I also suspect there’s a blog in it somewhere—and maybe some live tweeting or Instagramming. I’ll let you know how it goes. 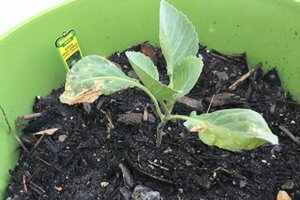 If we are hoping to find our meals in our backyard, we might have to look beyond the cabbage plant our third grader brought home from school. It’s not making much progress. But let’s think positively. At least it’s still alive. 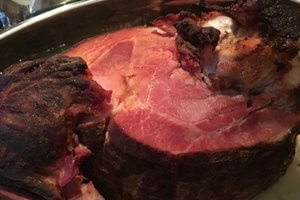 I bought a ham to cook after Easter, and it was delicious. Now the hambone is waiting to become soup. Our boys love soup, so I am hoping a ham and bean soup will be popular. Do you have favorite recipes you use for leftover ham? 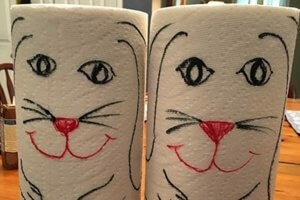 Daniel was practically headed out the door to school on Monday when we decided to make Easter bunny paper towel rolls for his teacher and teacher’s assistant. We usually make them with kitchen-towel ears, but this time I just drew them on, and Daniel glued the cotton ball tails onto the back of the towel rolls. It is still Easter, after all. 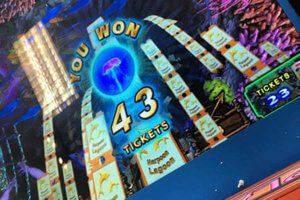 When the boys and I went to Chuck E Cheese last week, they were playing Harpoon Lagoon when the jellyfish came out of the treasure chest in the center of the game. Anyway, I jumped into the game and caught the jellyfish—which means I instantly won 50 tickets. I really felt amazing. But it also made me think. As a mother, I do all kinds of things that are invisible to our children. Many of them are hard. Some of them are easy. Motherhood was never a given for me, and I’m grateful to be able to do anything I get to do for my children. But I have to enjoy that moment when my sons think I am the most amazing person in the world, all because I caught a virtual jellyfish. Infertility Awareness Week is ending, and somehow it got away from me this year! I didn’t write anything about it this week. You’d think I might be done with infertility as a topic, but I actually have another idea, thanks to a reader who asked me for advice on how to share pregnancy news with a friend who’s dealing with infertility. Tune in for that post sometime soon. Last weekend the boys and I took a pinwheel to their cousin Georgie’s grave. I love taking them to the cemetery, but this was the first time we decided to pick up a little lunch on the way to the cemetery and sit by Georgie’s grave and eat. We sat and ate and talked to and about Georgie. We discussed Heaven and why people die and how long it takes to get to Heaven and whether people eat food in Heaven. 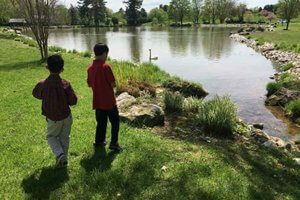 Then we went to the cemetery pond and looked at the water and the geese. We even saw the two swans. We fed the ducks and geese with pellets that were waiting for us there. We saw a few other people just sitting by graves, spending time in thought and maybe prayer. By the time we left, I felt renewed in a way. It wasn’t an entirely peaceful visit because the children are full of energy and life. But it was good. I hope you can find some beautiful moments this weekend, too.